Nahaha Lau (NL): Castle Peak Ceramic Company (CPCC) was founded in 1927 by Mr. Lee Tak Luen, Mr. Choi Yin Bo and Mr. Tong Chin Wan. 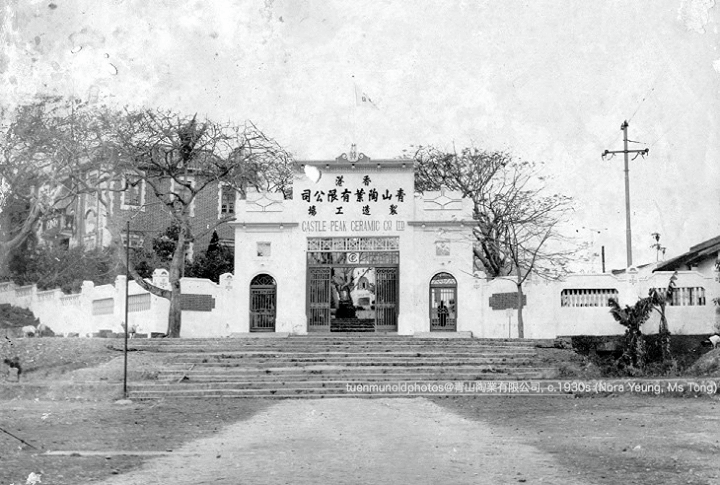 The factory was established near Shek Pai Tau and Tuen Mun San Hui. 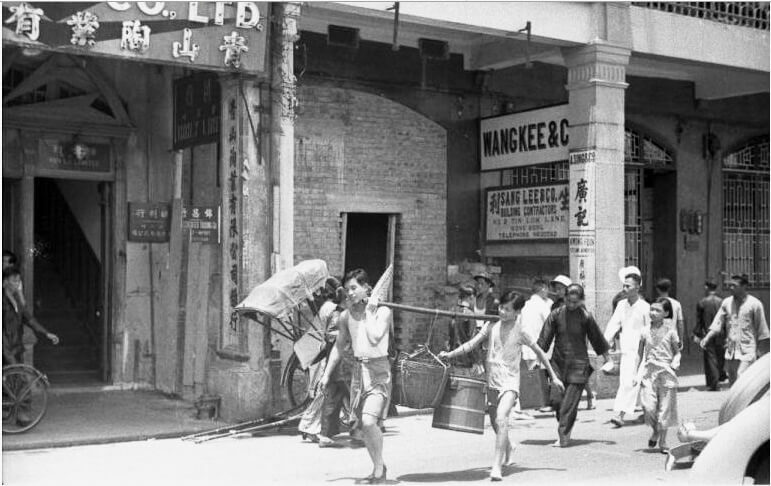 It was one of the biggest factories in the New Territories back then, and many Tuen Mun residents worked there to support their families. I have looked through the Tuen Mun Old Photos Facebook page and found images regarding CPCC. I contacted this page and we have been given permission to post these images by Mr Siu Chi Wah and Ms Nora Yeung, the original owners of the photos. 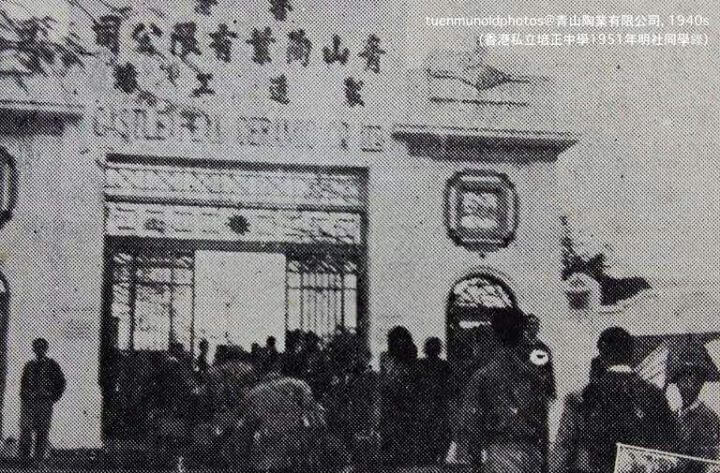 This photo, believed to have been taken in the 1940s, shows the entrance of the Castle Peak Ceramic Company. It is said that in the factory, there were two big downdraft kilns easy two-storeys tall. And there were rails connecting the factory buildings to jetties at the mouth of Tuen Mun River to ship the products. 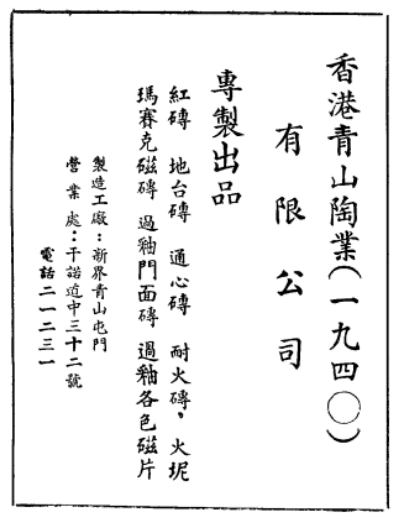 From the CPCC advertisement in the founding commemorative booklet of China Nanyang Economic Association published in 1947, we learn that the company specialized in producing red bricks, floor tiles, hollow bricks, firebricks, fire cement, mosaic ceramic tile, glazed door bricks, and glazed coloured ceramic tiles. CPCC had a sales office in 32 Connaught Road Central, which can be seen in the following picture (signboard in the top-left corner, and on the left column of the building). CPCC eventually closed down in 1950s due to reduced demand and intense competition. The factory was sold and turned into Tai Hing Cotton Mill, another famous factory in Tuen Mun. HF: There appear to have been two companies according to company records. Note a) shows the year of founding as 1928 not 1927 as suggested by NL above. b) Castle Peak Ceramic Company (1940) Ltd established 19th October 1940, dissolved 21st December 1971.This article was first posted on 15th February 2016.